The Gazette Girls did Around the World at Epcot on our 2008 trip and LOVED IT! It's one of the things I wish we could do on every visit to Disney, cost be darned. 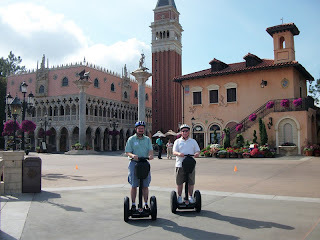 We had so much fun on the Segways, in fact, that we've booked a Raleigh Segway tour in June for Elizabeth's birthday. On the off chance we end up at Disney at the same time again, Ryan, I'll do the Fort Wilderness Segway tour with you!